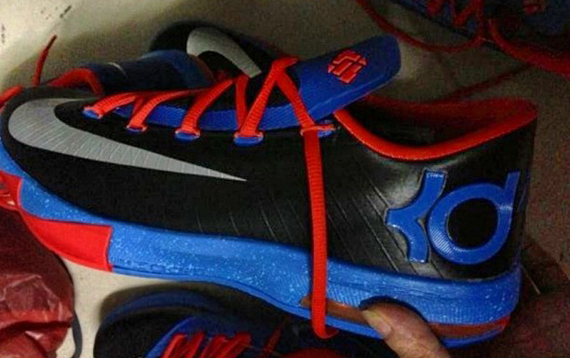 We're finally hit with a first look at what we can expect Kevin Durant to be rocking once the 2013-2014 NBA season rolls around. The new look for the recently introduced KD VI by Nike Basketball takes on a traditional OKC Thunder inspiration, sporting a predominantly black-based color scheme for road games. Orange and royal accents throughout the upcoming KD signature, finishing off a look we should expect to see worn plenty by Durant this upcoming season. Stay tuned to Sole Collector for further details on this OKC Thunder "Road" Nike KD VI.